Human Waste-Powered EcoBot III Cleans Wastewater! EcoBot III is a Human Waste-Powered Robot that Cleans Wastewater! 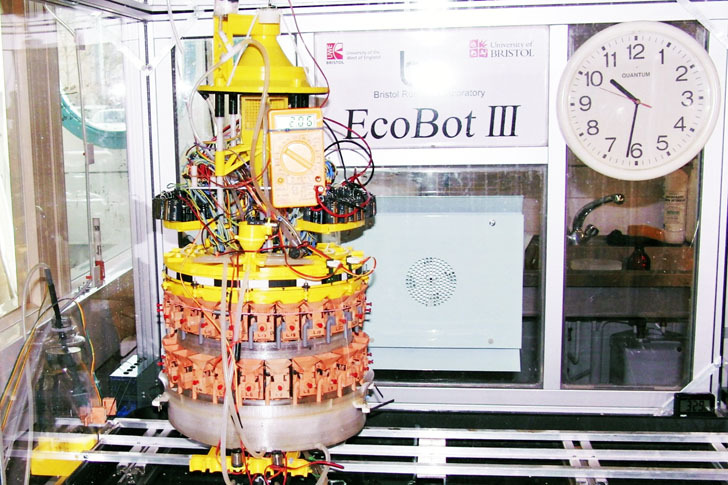 EcoBot III is a lightweight self-sustaining robot designed to clean wastewater! Powered by Microbial Fuel Cells (MFCs), the robot runs off human waste, using it to produce electricity necessary for performing its cleaning task. The project was funded by Engineering and Physical Sciences Research Council (EPSRC) and developed in collaboration between Wessex Water and the Bristol Robotics Laboratory in England. According to Dr. Julian Dennis, Wessex Water’s Director of Innovation and Research, this technology could eliminate the need for electricity in the process of sewage treatment, ultimately reducing our carbon footprint. Currently under development, the technology could be applied in remote areas where the robot could run off organic waste. The main objective of the project was to create a self-sufficient machine with an onboard fluid circulation that would collect energy from its environment and get rid of its own waste. The robot is only about 6 kg and consists of the ingestion, artificial digestion and solid waste excretion mechanism. Underneath the Microbial Fuel Cells there is an overflow collection tray which feeds back into the ingestion vessel above.